Feline distemper, known as feline panleukopenia, is a highly contagious and deadly disease. Feline and canine distemper are two different diseases. Dogs and people cannot catch feline panleukopenia, but it can be acquired and transmitted by cats, raccoons, minks and possibly skunks and otters. The Merck Veterinary Manual provides an online synopsis which illustrates the transmission and fatal mechanisms of the feline panleukopenia virus. It is estimated that between 50 percent and 90 percent of cats who contract this virus will die. Symptoms usually show up ten days after infection, and the disease progresses very quickly at that point. If your cat shows any of these symptoms, seek veterinary attention right away. Distemper is diagnosed by ruling out other diseases and testing the stool for shed virus. Cats that have recently been vaccinated will show a false positive result. Panleukopenia is incurable if advanced, and it usually runs its course in about a week. Treatment involves minimizing the impact and keeping the cat alive until the immune system has overcome the virus. Administering IV fluid keeps the cat from dying from dehydration. Antibiotics are used to address intestinal bacteria that flourish while the immune system is busy fighting the virus. Sick cats should be kept in a warm, draft-free environment while being treated for the disease. They often lose the will to live and need a lot of love, petting and attention. They may even require hand-feeding. Cats that survive for more than five days will usually recover. Full recovery can take several weeks. Panleukopenia is transmitted by all bodily secretions including feces, vomit, urine, saliva and mucus. Contact with infected cats or food dishes, bedding and kennels used by infected cats can spread the disease. People cannot catch the virus, but they can infect other cats when their hands or clothing become contaminated. Fleas and other insects also spread distemper. Outbreaks are common in animal shelters and catteries. The virus can survive up to a year outside the host, and it's resistant to most disinfectants and freezing. People living in households where distemper has been present should throw away all dishes, bedding and carriers used by the infected cat and not introduce a new cat for at least one year. A ten minute treatment with bleach and water solution (1:32) will kill the virus. If a pregnant cat catches the virus, she will usually lose the kittens. 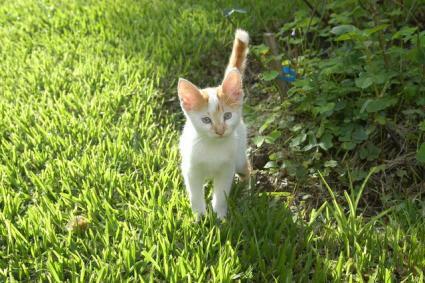 Kittens who survive are born with damage to the cerebellum called Cerebrellar hypoplasia (CH). According to Cornell College of Veterinary Medicine, the cerebellum is part of the central nervous system, and kittens affected by CH suffer losses in coordination, balance and movement. It's worth noting that CH cats are not mentally impaired, and some live fairly normal lives. However, others are severely debilitated. Vaccination during pregnancy can also cause CH. Nearly all cats will be exposed to the Panleukopenia virus at some time in their lives. The best defense against it is a good diet and a healthy immune system. Avoiding exposure to strange cats and wildlife can help reduce the risk. Keep your cat indoors, and find out if previous tenants have had sick cats before moving into a new house. You can become contaminated without knowing it and bring the disease home to your cat. Vaccination is very controversial, and with all of the conflicting information it can be difficult to know if you are protecting or harming your cat by vaccinating. It is important to understand that vaccination is not an all-or-nothing issue, and there are many factors to consider. The Cornell College of Veterinary Medicine lists the feline panleukopenia vaccine as one of the most successful inoculations in the veterinary field and recommends all cats get the vaccine. Unlike many vaccines that have a significant failure rate, the panleukopenia vaccine is very effective in preventing the disease. VetInfo.com reminds pet owners that this vaccine should never be administered to kittens under four weeks of age. Research at the Colorado State University has shown that the distemper vaccine can cause chronic renal failure, a common cause of death in cats. The killed virus vaccine is known to cause fibrosarcoma, a form of cancer. According to MedicineNet.com, the distemper virus is difficult to kill, difficult to avoid, and easily spreads. It kills half or more of the cats who catch it. Keeping all of these facts in mind, vaccinating for distemper with the modified live virus offers a good chance of saving your cat's life despite the harm that may be caused by the vaccine. Due to the controversy surrounding the distemper vaccine and its protocol, pet owners should research this dilemma carefully. Some resources will cite contradictory information regarding the appropriate immunization age for kittens, which only adds to the confusion. Choose your cat's preventative health measures under the guidance of your veterinarian. Be sure to ask your vet specific questions regarding the safety of a vaccination protocol and any negative experiences that have occurred during its administration. Posing educated questions about your animal's health is key to finding a quality veterinarian and also providing your pet with the best care possible.